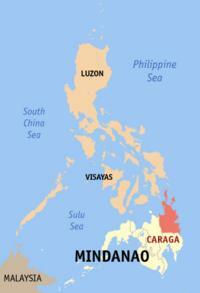 Caraga is an Administrative Region of the Philippines, on the northeastern portion of the island of Mindanao. It is the newest region in the Philippines, and is also called Region XIII. The Caraga Region was created through Republic Act Number 7901 on February 25, 1995. The region is composed of four (4) provinces: Agusan del Norte, Agusan del Sur, Surigao del Norte and Surigao del Sur; three (3) cities: Butuan, Surigao and Bislig; seventy (70) municipalities and 1,346 barangays. Butuan City is the regional center. Caraga Region, situated in the northeast section of Mindanao, is located between 8 00’ to 10 30’ N. latitude and 125 15’ to 126 30’ E. longitude. It is bounded on the north by the Bohol Sea; on the south by the provinces of Davao, Compostela Valley and Davao Oriental of Region XI; on the west by Bukidnon and Misamis Oriental of Region X; and on the east by the Philippine Sea and the Pacific Ocean. The region has a total land area of 18,846.97 km². This represents 6.3% of the country’s total land area and 18.5% of the island of Mindanao. 47.6% of the total land area of the region belongs to the province of Agusan del Sur.